It was 88 degrees and he was standing on hot asphalt in the parking lot and he was wearing a Dudley Do-Right-esque hat. His body looked healthy and strong but his gate was feeble and frail. His face and his teeth gave his true age away yet his smile was as big as his determination. With his brief case in his hand, he began looking around ever so confused as if he had lost his way, head turning from side to side. I pulled into the parking lot and ask if I could give him a ride and after a bit of confusion about the address, off we went in search of a house where he was seeking help with his computer. I ask him his name and he replied, “I’m Gene Fleming and thank you for taking so much of your time to help me.” I laughed of course and told him it was no problem that I was happy to do it and so as not to offend him or make him feel elderly, I mentioned how hot it was to be walking on asphalt. I’ve learned in my many years as an elderly advocate that there is a certain psychology which one must employ to ensure that the dignity and independence of a senior is preserved. 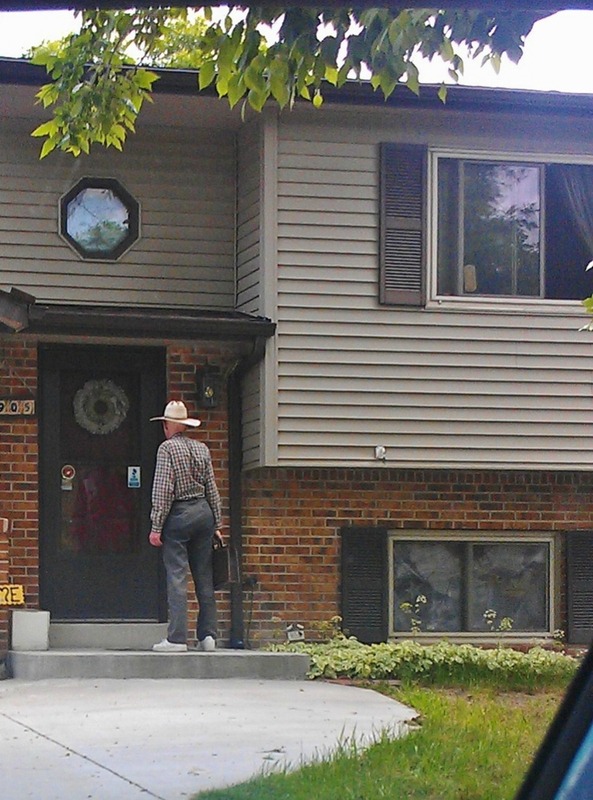 When we arrived at the house I told Gene I would be happy to wait for him to give him a ride back home. That is when he told me where he lived and to my astonishment he had taken a city bus then walked almost a half a mile before I found him. He was bright -eyed like a newborn eagerly anticipating his new day. He was determined not to let age prevent him from thriving. I apologized for my car having so much stuff on the seat and in the floor and made a joke about it being a girl thing, he remarked that his beloved wife who had died recently always kept her car in the same condition. Naturally, I insisted on giving him a ride home when he was finished with his business but to no avail, he continued to insist he would be fine. As I waited until the owner answered the door of the house we arrived at, I took a picture of him standing at the door…there was just something so sweet and vulnerable about this man. I struggled to pull away from the curb. I drove home uneasy. My instinct was urgently begging me to drive back immediately and wait in front of the house but I had business to take care of so I finished it as quickly as I could and jumped back into the car within 35 minutes. I returned to the house and sat in front of the home patiently waiting, praying he was still there and feeding the neighborhood squirrels with the stash of peanuts I keep in the trunk of my car. After waiting for 30 minutes I went up to the door and rang the doorbell…no one was home. Now I was really struck…where could they have gone so soon? It’s funny how the imagination runs amuck even though your sensible self knows all is fine. I continued on the Office Max to pick up my order and wouldn’t you know it they were backed up so 5 minutes turned into 30 which I knew was a perfect timing thing. I just had to return to the house one more time to ensure that little fellow had made it home safely. When I got back to that home, the garage door was opened and the dogs were barking in unison. I rang the doorbell and a lovely older woman answered with the phone glued to her ear. She waved me in and I told her who I was and that I was concerned about Gene and wondering if he had gotten home safely. She said, “Who?” and the blood drained from my face. I explained with haste, she nodded and said he had not given his name. He found them through an ad and yet her husband was kind enough to drive him the long way back to his home. As we stood there talking she told me she was a seamstress and I just had to laugh, partially from relief that Gene was fine and on his way home and because I had been looking for a good seamstress for several weeks. Moral of the story, do all the good you can at all times, trusting your instincts. As it turned out, this lovely road, catering to an elderly man, also brought me to my destination in finding a seamstress. You never know where Spirit and your highest self are leading you but you sure do want to follow.